Upon returning to the UK back in November 2014, I had put the truck in storage and within days was flying to start a new job, my first in almost eight years. Although this necessitated basing myself a singularly charmless part of northwestern Europe, the job as a geoscientist for a large energy company offered the possibility of relocating internationally in the future and, of course, a chance to replenish my bank balance after years of travelling. Most appealing in the short term however, were the generous holidays and so after less than six months in the position, I was able to use my annual leave to make a trip of almost nine weeks, focussing on a return to Russia to make a south-to-north journey across the country. After taking the truck out of storage, I departed from the office car park on the afternoon of the 8th May 2015, stopping with my cousin in Jena, Germany, then continuing the next evening, roughly retracing my route from November of the previous year to the Turkish border. This first stage of my 2015 journey would take me rapidly across northern Turkey, weaving between the dramatically beautiful Black Sea coastline and the rugged interior of northern Anatolia. Then, from the striking mountains of Turkey’s north-east, once part of an ancient Georgian kingdom, I would enter Georgia, climbing from the Black Sea to drive across the country into Azerbaijan and on to the shores of the Caspian from where, after a brief trip into the eastern Caucasus, I would enter Russia. I cross the Turkish border at Kapikule on the afternoon of the 11th May 2015, driving across the rolling landscape of Thrace towards the bottleneck that is Istanbul. I’m sucked into the fast-moving traffic of the city’s sprawling western suburbs where I make good progress towards the centre but miss a critical turn which would have taken me to the ferry port in Sirkeci, and instead get lost in heavy traffic just north of the centre. I make my way into the gridlock approaching the Bosphorus Bridge, and emerging some time later on the city’s Asian side, become lost again in the back-streets of Kadıköy until I realise that the name ‘Çevreyolu’ refers to the main road I have been searching for rather than a city unmarked on my maps, and finally exit Istanbul late in the evening, heading east into Anatolia. On the following day, the road takes me through beautiful forested hills, passing the turning south to the capital, then leaving the main highway to stop in the beautiful town of Safranbolu, which nestles in a small gorge and has a preserved centre of white-washed Ottoman-era houses with wooden window frames and terracotta-tiled roofs. Safranbolu is something of a tourist town, popular mostly with domestic tourists, but it’s out of season and with the pleasant warmth of early summer and cloudless deep blue skies, it makes a wonderful place to stop and rediscover one’s senses after months of appalling weather in the blandness of Western Europe. 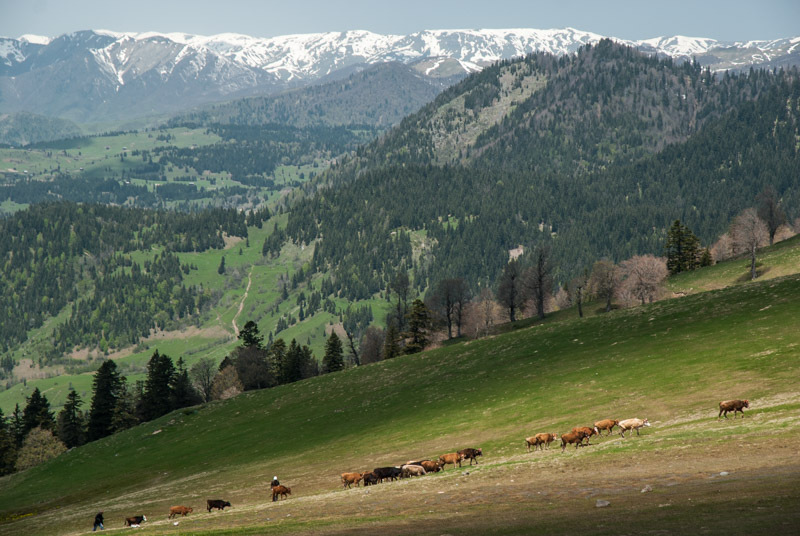 From Safranbolu I drive north, crossing the rolling slopes of the Pontic Mountains which are richly covered in dark pine forest with contrasting patches of bright lime-green from beech trees newly in leaf. Perched on some of these slopes are rustic half-timbered houses above small clearings and villages where time passes slowly; where the elderly sit under shady trees and dogs doze at the roadside. 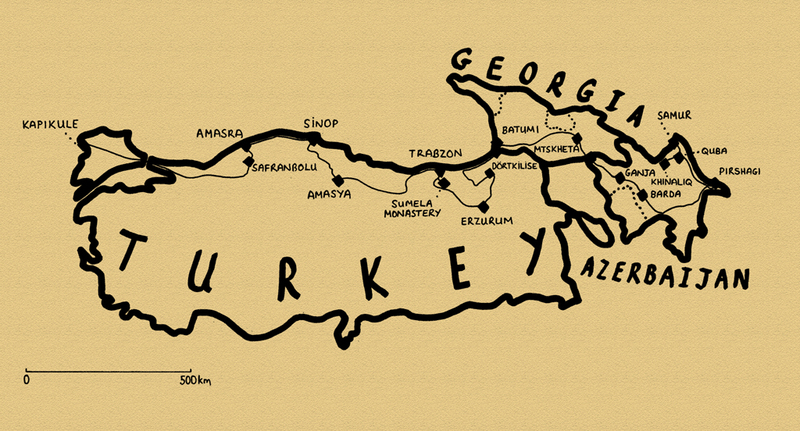 I join the D010, the coastal highway, and above the town of Amasra get my first dazzling view of the Black Sea. I stop for a moment at the Kuşkayası Monument, hewn in the first century CE from the native limestone and consisting of a now headless Roman eagle and headless Roman figure who may have been the emperor or provincial governor. 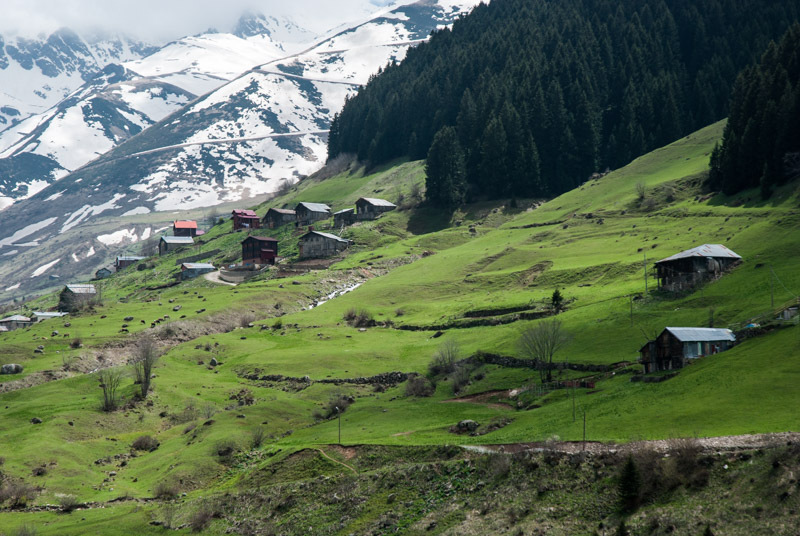 Having long been cut off from the interior by the Pontic Mountains, with access far easier by sea than by land, the Black Sea Coast has a history somewhat distinct from the rest of Anatolia. A prehistoric crossroads between the Mediterranean world, the Eurasian Steppe and the Caucasus, the earliest history comes from the Greeks, who named it the Euxine or ‘hospitable’ sea and settled what is now the north coast of Turkey starting in the early first millennium BCE. These coastal colonies of the Ionian Greeks (centred on what is now Turkey’s Aegean Coast) would become part of local kingdoms; Bithynia in the west and Pontus in the east, spreading around the coasts of what is now Georgia, Russia and Ukraine. In the first century BCE these were combined and incorporated into the Roman province of Bithynia and Pontus, and it is from this period that the Kuşkayası Monument dates. Amasra is a charming small town whose harbour is surrounded by Byzantine and Genoese fortifications, but I stop only for a brief walk before continuing eastwards. 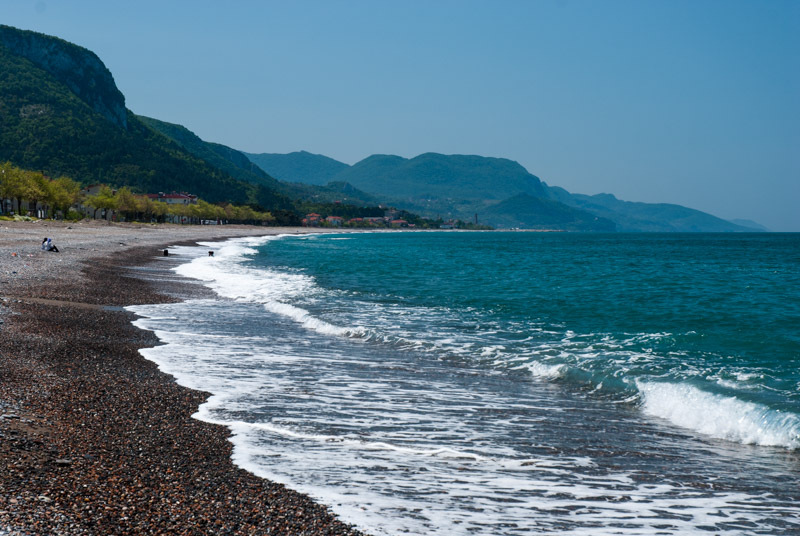 The coastal highway is stunningly beautiful, at times narrow where it hugs the cliff-tops with views along indented bays, then dropping down to quiet seaside towns such as Cide, with its long, empty pebble beach at the foot of a dramatic coastline. Further east, the road climbs once more into the fragrant forest of the mountains’ lower slopes, giving magnificent views over the gleaming turquoise of the Black Sea, which here I find even more picturesque than the usually deforested coastline of the Mediterranean. After an overnight stay in the town of Ayancık, on the following morning I reach the small city of Sinop, located on a large headland forming the northern-most point of the coastline. Sinope was founded as a Greek colony in approximately the seventh century BCE and would go on to become one of the capitals of the pre-Roman Kingdom of Pontus, ruled by the Persian Mithridatic Dynasty who are thought to have descended from the Achaemenids. 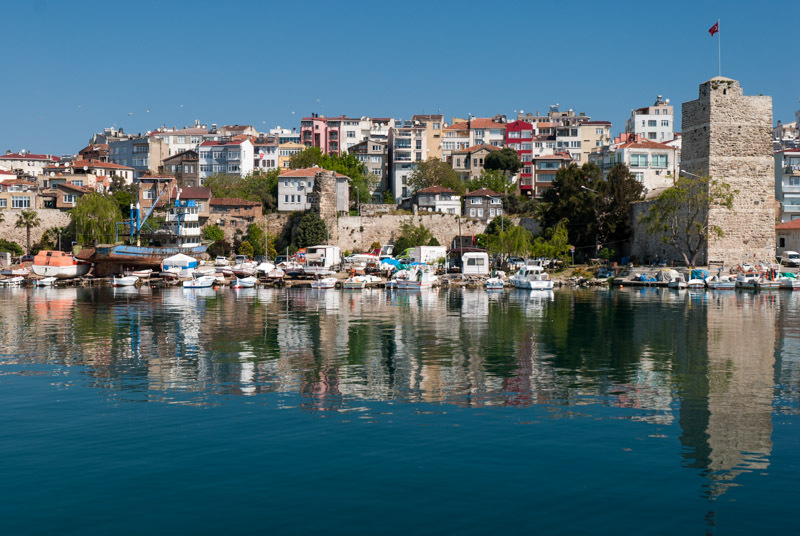 Somewhat larger than Amasra, I find Sinop an immediately likeable place with its compact, walled centre and beautiful harbour, gently busy with fishing boats and with a magnificent view back towards the emerald-coloured mainland as a backdrop. 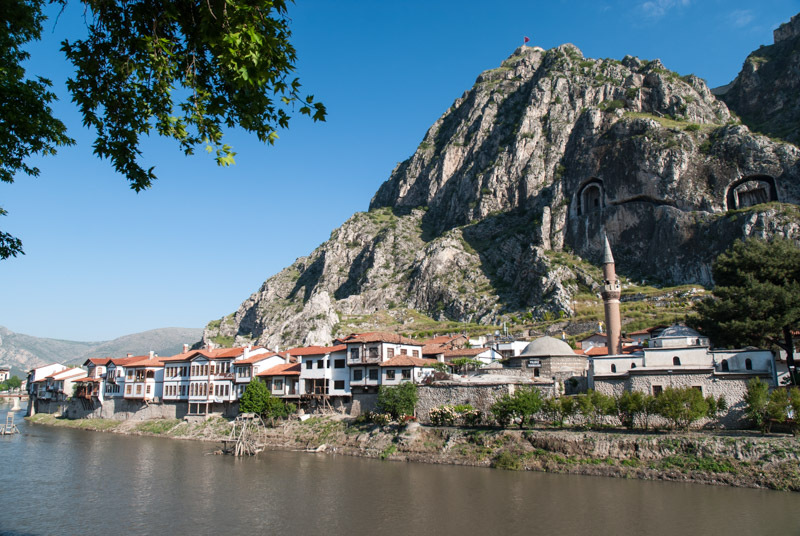 In the afternoon I drive inland, through a winding valley dotted with rice paddies and brush-like poplar trees, climbing to the city of Amasya. 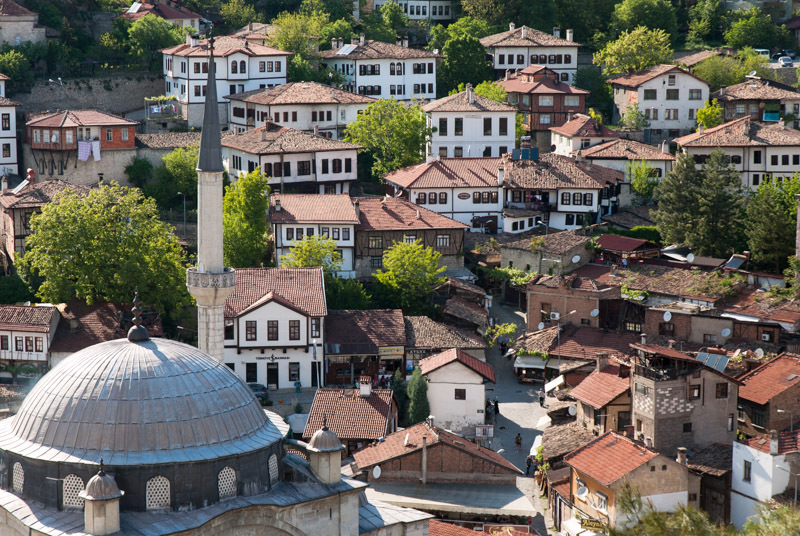 Also a capital of Pontus, and birthplace of the Greek geographer Strabo, unlike Sinop, Amasya was a place of importance well into Ottoman times. Situated on the banks of the Yeşilırmak River in a scene which reminds me somehow of Kabul, Amasya retains an elegant, if slightly over-restored river-front of Ottoman houses. Above this rise almost sheer cliffs which in the third and second centuries BCE were carved into the necropolis of the Pontic royal family, in a tradition similar (though less elaborate) to their Achaemenid forebears in central Iran. I drive initially east from Amasya, then turn north and cross the Pontic Mountains once more via the Eğribel Pass, where in places there is still more than a metre of snow along the road-side, dropping through a steep limestone gorge and more thickly forested mountains, down to the coast just east of Giresun. This eastern stretch of the Black Sea Coast is very much more developed than that which I have passed through so far, and the coastline less attractive, but the views eastwards towards the snow-capped mountains near the Georgian border are captivating. By late afternoon I reach the city of Trabzon, the most famous of Turkey’s Black Sea cities. Also founded by Greek colonists in the eighth century BCE, the city’s heyday would come long after, as seat of the Empire of Trebizond, a successor state of the Byzantine Empire following the disastrous sacking of Constantinople by the Latin (Roman Catholic) Fourth Crusade in 1204. Later in the thirteenth century Trebizond would become fantastically wealthy as a result of trade routes across Anatolia being pushed northwards by the Mongols, with Venetian and Genoese merchants (such as Marco Polo) receiving goods from the Silk Road in the city’s port. Trebizond was a place of luxury and high culture; an oasis with a mainly Christian population in the Turkish heartland of Anatolia until its conquest by the Ottomans in 1461, who in overthrowing Trebizond, put an end to the Byzantine Empire and a tradition which had started with the Romans almost 1500 years earlier. There are few outward signs of this historical richness in modern Trabzon, but in a park planted with palm trees at the side of the coastal highway one finds the thirteenth century Hagia Sophia Church, far more restrained than its namesake in Constantinople but nevertheless a beautiful piece of late Byzantine architecture with well restored frescoes, thankfully still on display despite the church recently being controversially reinstated as an active mosque. 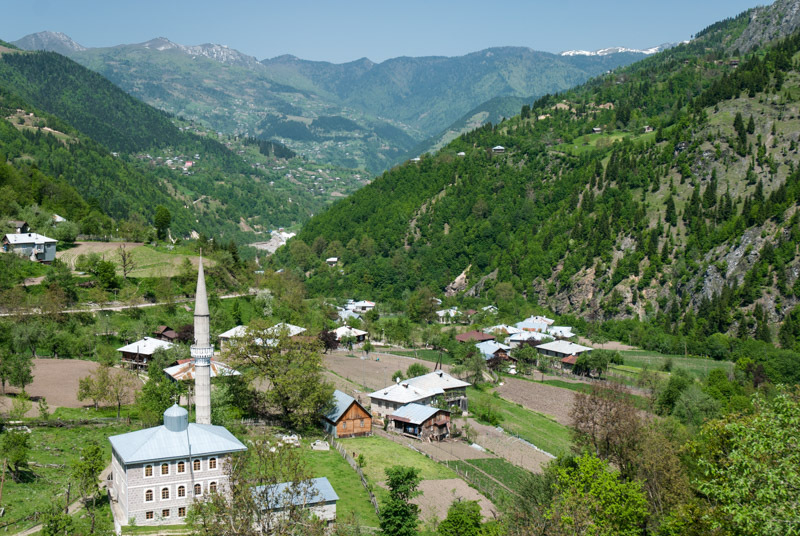 Following the Ottoman takeover, Trabzon’s Pontic Greek community slowly declined as a result of voluntary emigration and conversion. Imperial Russia, which had long coveted the southern coast of the Black Sea, launched numerous wars with Ottoman Turkey in the nineteenth and twentieth centuries and the region’s Christian population frequently supported the invading Russians. These actions no doubt contributed to the atrocities committed against Christians in the closing days of the Ottoman Empire, with Trabzon witnessing the deportation and genocide of Greek and Armenian populations as part of a greater tragedy which was replayed all across central and eastern Turkey. 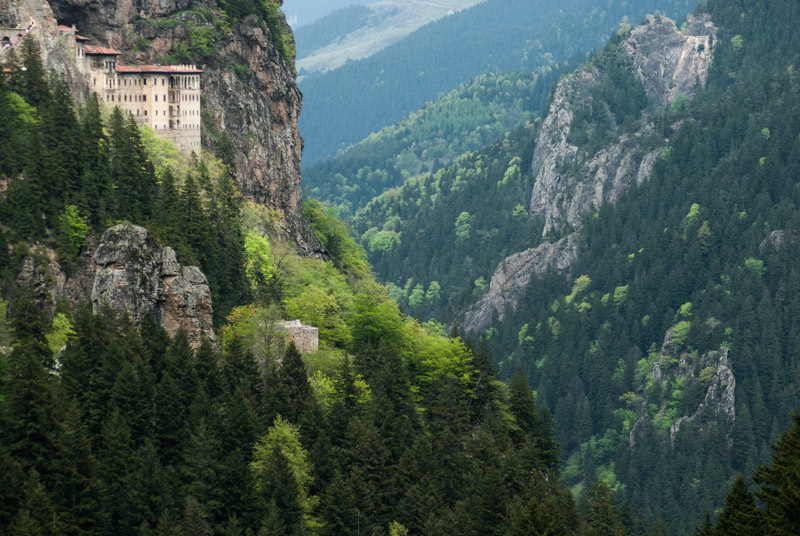 The Pontic Mountains have been a refuge for monastic Christianity since the beginning of the Byzantine period, and I stop on my way south at the gorgeously located Sumela Monastery, said to date originally from the fourth century, which clings iconically to an almost sheer cliff in a steep, forested valley of the Pontic Mountains. To my dismay, the approach to the monastery is thronging with tourists, to the point where I consider leaving, but I persevere. Entering the inner courtyard of the monastery, behind the facade of the dormitory and refectory which are visible from the valley below, one enters a small courtyard in the shadow of the overhanging cliffs, out of which the original Rock Church has been partly carved. 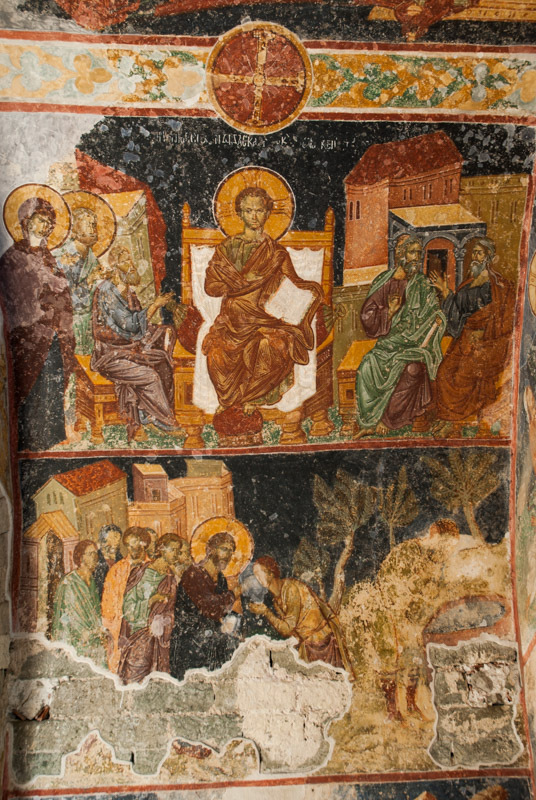 Both exterior and interior of the Rock Church are densely covered in frescoes, including a huge Christ Pantocrator on the cave-ceiling within, though there is plenty of evidence of vandalism and graffiti (much of it in Greek script) dating from after the monastery was abandoned in 1923 upon the deportation of the Greek population. Leaving Sumela, I continue inland, crossing the Zigana Pass and driving south-eastwards into the mountains and treeless steppe of the interior, towards the city of Erzurum. Despite years of overland travel in Eurasia, this is my first visit to a city which lies firmly on the Great Eurasian Overland, lying on the main route between Istanbul and Tabriz. I’d long imagined that Erzurum to be another bland and shambolic Kurdish city, but I soon find this to be quite wrong. I’m hosted by Ahmet, a Kurdish student who introduces me to a group of his friends, who take me out to eat the city’s famous Cağ Kebab, a horizontally rotating Döner Kebab which apparently originates from Erzurum. We then walk briefly around the city centre before retiring to a low-ceilinged tea house, where we recline on cushions for all-male conversation in an atmosphere thick with tobacco smoke. Erzurum is located on a windswept grassy plain flanked to the north and south by rows of snow-capped mountains and feels somewhat depopulated, with what appears once to have been the centre now mostly a collapsing expanse of old buildings, derelict or half-demolished, surrounded by a jumble of bland modern apartment blocks. 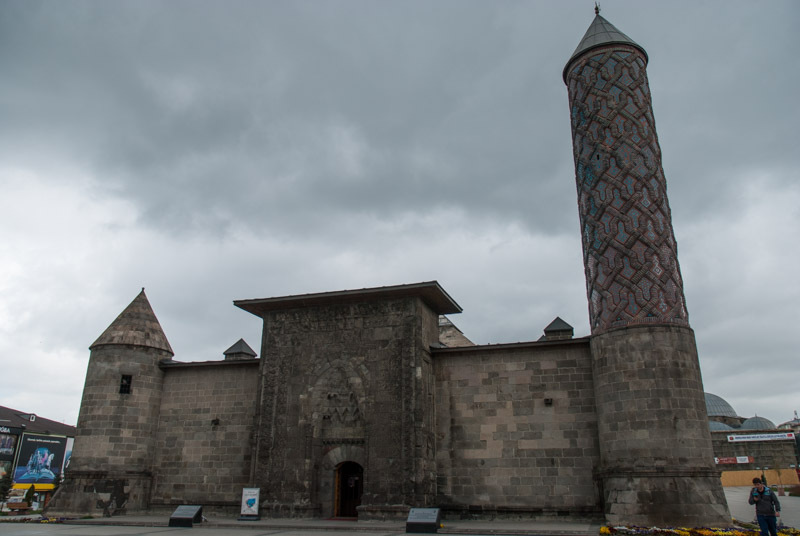 In amongst this however are a clutch of glorious medieval monuments, such as the imposing bulk of the fourteenth century Yakutiye Madrasa dating from Ilkhanid times, which manages to juxtapose brutal, militaristic bulk with fine and intricate decorative detail. Inside the former seminary, now an art museum, the stonework is magnificent with graceful stone arches and an ocular skylight surrounded by finely carved muqarnas (corbels). 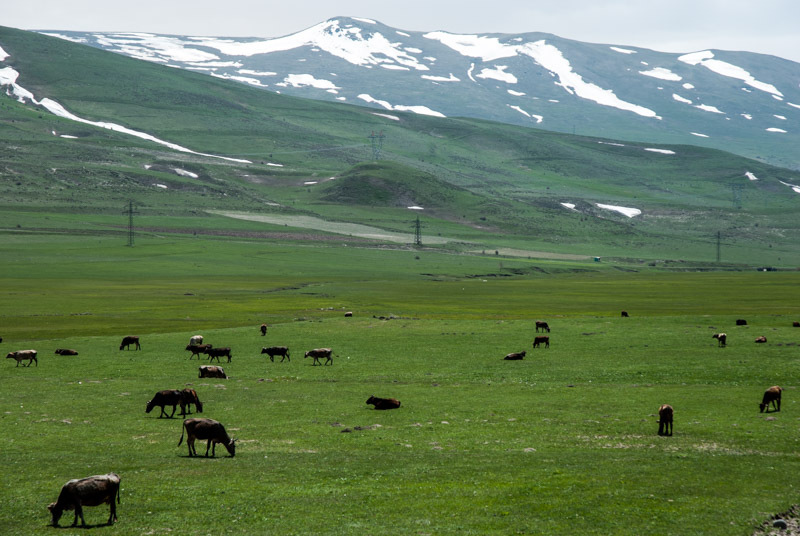 Driving north out of Erzurum, one crosses a high grassland plain grazed by cattle and backed by snow-streaked mountains, a beautiful scene which must have stirred the souls of the nomadic Turks and Mongols who arrived here from the steppes of Central Asia and made Erzurum their home. Soon after crossing a low pass the landscape changes dramatically to the steep rocky valley of the Tortum River, planted with walnuts and poplars and irrigated by milky glacial streams. This also marks what was historically a cultural boundary, into a region which is regarded as an ancestral homeland by the Georgians. These valleys of north-eastern Turkey were part of the ancient Georgian Kingdoms of Iberia and Colchis, which would become part of the Achaemenid, Roman, Byzantine, Sassanian and Arab Empires. It was in this region north of Erzurum, then the Principality of Tao-Klarjeti, that the roots of a unified Georgian state would emerge in the early ninth century CE. It was here that the Bagratid Dynasty (who also contributed leaders to the Armenian line) established a Georgian prince, the descendants of whom would oversee a cultural flourishing of Tao-Klarjeti in the late tenth century, then in 1008 under Bagrat III the establishment of the first unified Georgian state and an end to centuries of power struggles. Today the remains of this cultural high period of Tao-Klarjeti, built during the reign of King David III in the tenth century lie in various states of ruin in these beautiful valleys of the southern Pontic Mountains. I start by visiting the large and well preserved church of Khakuli, now a mosque, in whose cold interior I listen to a man reciting verses from the Quran. Nearby, the even larger but ruined cathedral of Oshki stands in the middle of the village of Çamlıyamaç, its broken roof allowing in alternating rain showers and shafts of sunlight to illuminate its exquisite stonework. 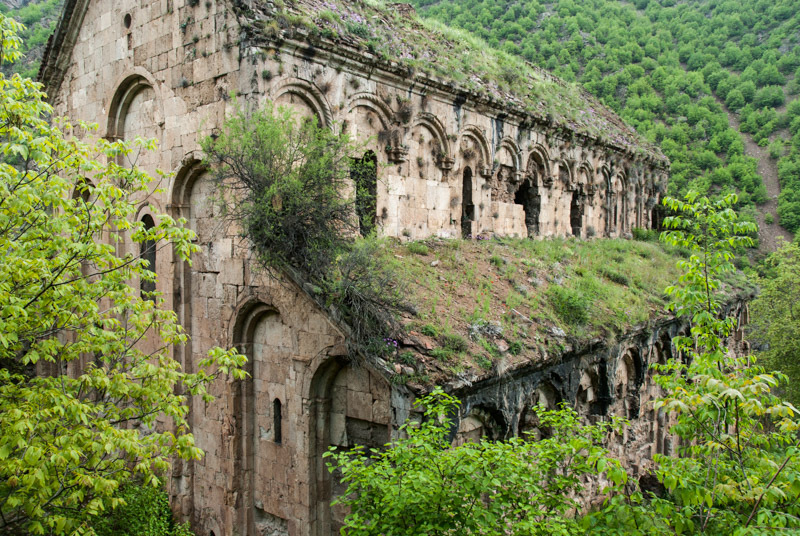 Further north, above the Oltu Valley is the church of Ishkhani, but its clumsy restoration by Turkish authorities has rather robbed it of both poignant dereliction and its original grace. The fourth and final church which I visit is however my favourite; situated further to the east in the Çoruh Valley, reached up a steep unpaved road beyond the village of Dörtkilise, the monastery of Otkhta sits in dignified ruin seemingly almost consumed by burgeoning spring-time vegetation like a Christian Angkor Wat, sitting alone among a few garden plots and vertical scenery. The interior of Otkhta, whose walls retain traces of frescoes, bears the definite smell of livestock and its a rather ignominious fate for such a glorious building, but such is the history of cultural decline across much of eastern Turkey. As the balance of power shifted around the borders of medieval Georgia, it would become once more fractured and a vassal of regional empires in the fifteenth century. The region of Tao-Klarjeti would be absorbed into the Ottoman Empire in 1545 and aside from a forty-year period of Russia rule, would stay under Muslim rule until the present day. I spend the night next to Otkhta, and in the morning continue along the beautiful Çoruh Valley, dotted with ruins of ancient Georgian castles. Turning north just after İspir I climb into a winter landscape of blinding white snow, crossing the 2650 metre Ovit Pass and descending through the beautiful İkizdere Valley, where villages of wooden houses cling to the steep grassy mountainsides, then descend to the balmy warmth of the coast through striking, lime-green tea plantations near Rize, where I turn eastwards once more towards the Georgian border. This far-north-eastern region of Turkey is home to yet more minorities; the western Georgian Laz People, thought to descend from the ancient Colchians, and the Hemshins, highlanders thought to be descended from medieval Christian Armenians. It’s late afternoon by the time I reach the Georgian border crossing at Sarp and less than an hour later, I’m in Sarpi, Georgia, watching a beautiful cloudless sunset over the Black Sea. I stop in Batumi, Georgia’s second largest city, for three nights, taking a break from the rather brisk pace of travel I have kept up on the trip so far. Batumi was established as a Colchian-Greek colony but has no outward signs of age, and currently has the air of an out-of-season tourist resort with a seafront of bold, modernist buildings, an unremarkable pebble beach and a mixture of new and old architecture; a far cry from the exotic beauty of Abkhazia or some parts of Crimea, but a pleasant place to spend two relaxing days nonetheless. The Georgians here are as I remember them; driving around town flat-out in ailing European cars, but are otherwise strangely unobtrusive and the air of progress and change which I have noticed on previous visits to Georgia seems somewhat diminished here. One real highlight is Batumi’s magnificent Botanical Garden, established in the nineteenth century by a Russian botanist and located a few kilometres north of town, which I visit on my second day in the city. 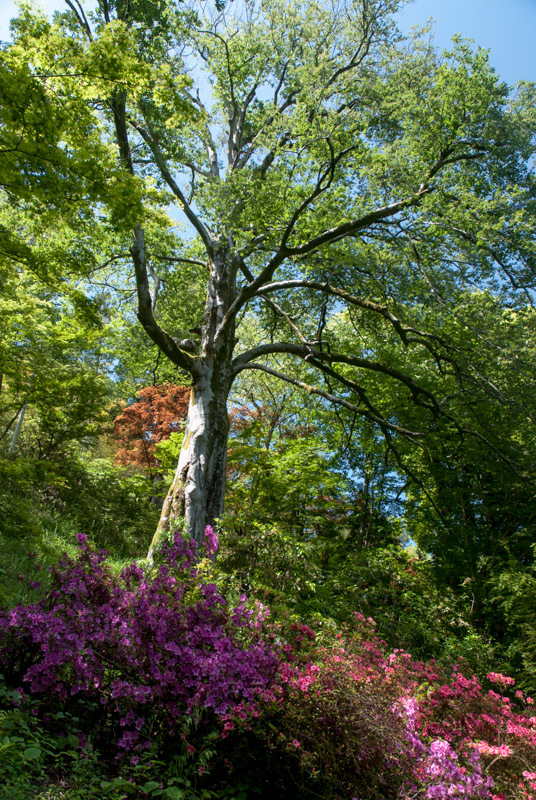 The gardens consist of glowing hillsides of species from across the world, though those from East Asia and North America are the most vividly beautiful; giant magnolias and sequoias, rhododendrons, azaleas, japonicas, cedars and palms, all looking out across the limpid blueish waters of the Black Sea on a day when sea and sky merge seamlessly at the horizon and the verdant green hills of Georgia stretching off into the haze to the north look like something of an Earthly paradise. Batumi is in fact the capital of the Adjaran Autonomous Republic, commonly known as Adjaria, which spreads up into the Lesser Caucasus Mountains behind Batumi and along the Turkish border. The Adjarans were once subjects of the Ottoman Empire and were distinguishable for having adopted Sunni Islam, though nowadays the majority of Adjarans are Orthodox Christians and the environs of Batumi look no different from anywhere else in Georgia. I leave Batumi and drive west, climbing away from the Black Sea for the last time, into the Adjaran hinterland. As I climb up the Acharistskali Valley I pass attractive, sprawling villages with large stone hoses perched on steep hillsides above neat garden plots, in places almost idyllically beautiful with views over the yawning valley. In the town of Khulo I notice for the first time a large mosque with an Ottoman-style minaret (no doubt funded at least in part by Turkey), which looks somehow odd against the rural Georgian landscape, but I suspect that religion is worn lightly by the region’s inhabitants. Beyond Khulo the road climbs above the level of permanent settlements into a landscape which seems only recently relieved of its winter snow-cover, and I stop on the Goderdzi Pass at around 2000 metres elevation to watch a cow-herd trail his cattle up the steep grassy mountainside in front of me, with a stupendous backdrop of still snow-capped mountains to the north and the wooded valleys of Adjaria far below. Once over the pass it’s a long and rather less scenic drive through central Georgia, dropping down to Akhaltsikhe and then on via Borjomi to Mtskheta where I stay for a night with Gerhard and Julia, with whom I had stayed several times last year. I continue the following day, taking the bypass around Tbilisi and crossing out of Georgia and into Azerbaijan on the main road to Baku. I’m a little disappointed at the Azerbaijani border to notice that (in contrast to my two previous experiences entering the country) it is visibly corrupt, with money and bottles of drink changing hands between passengers and the customs officers, who seem like the typical half-educated idiots of a police state. My negative impressions are furthered when, not long after driving away from the border, I’m stopped by traffic police for some farcical traffic infraction and made to hand over some cash in the back of their patrol car. 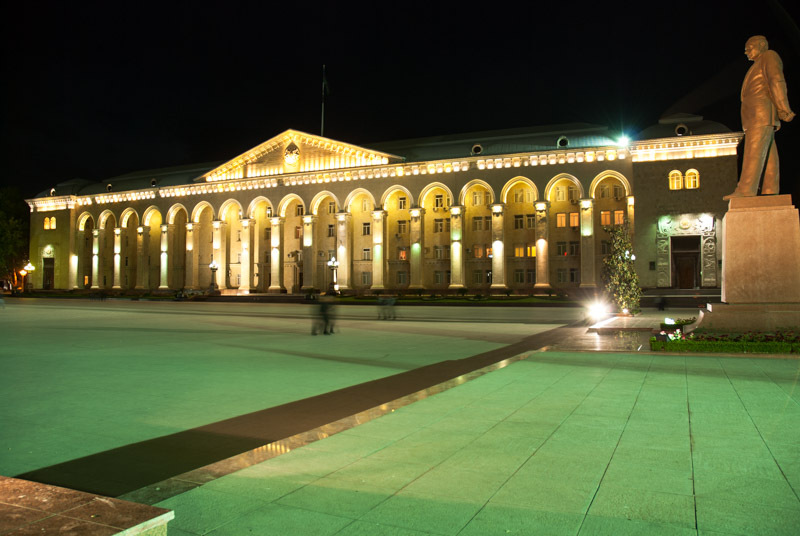 Whilst neighbouring Georgia and Armenia have moved firmly on from the Soviet period and opened up to the outside world, it is Azerbaijan, by far the richest of the three countries, which remains mired in the insular mentality and shameless corruption which marked the era of the Soviet collapse. I reach the city of Ganja after dark, which has the slight Potemkin-esque atmosphere of a large city in a dictatorship; the statue of First President Heydar Aliyev and accompanying museum, the de-Sovietised City Administration Building set in a vast square, a limited range of shops along a paved and well-lit main street, but otherwise no real civic investments and dark back-streets of broken roads and shabby housing. As ever though, the people of Azerbaijan are extremely friendly, and curious to meet a rare foreign visitor. After eating a kebab and having a short walk around Ganja, I leave, and after some difficulty navigating the totally unsigned city streets I return to the main highway. Managing to avoid any further encounters with the police, I reach Yevlakh and turn south, stopping for the night just before reaching Barda. Barda, formerly known as Partav, was once the capital of Caucasian Albania, a historical kingdom whose territory covered much of modern Azerbaijan and of which much remains unknown, including the kingdom’s origins and even its endonym. Like other Caucasian nations it was a vassal of larger regional empires (usually Persian), and has recently become the rather unfortunate subject of Azerbaijani historiography which falsely claims much of the region’s Armenian heritage as being ‘Caucasian Albanian’ in an attempt to refute the historic presence of Armenians in Nagorno Karabakh and Nakhchivan. I reach Barda early the next morning and watch a sleepy provincial town come to life, with butchers cutting up carcasses on the street-sides, children fetching bread and women sweeping with hand-made brooms. Following the Arab takeover of Persia in the seventh century, Barda retained its importance as a centre of trade but was subject to raids, most curiously by the Varangians of Rus’ in 943, who occupied the city until being forced to return by an outbreak of dysentery, but more seriously by the Mongols and Timur who devastated the city. I make my way to Barda’s only surviving monuments; a fragment of ancient mud-brick wall allegedly of Albanian age, and the beautiful tomb tower of Akhmad Zocheybana which is covered in turquoise-tile Kufic faïence and undergoing a much-needed restoration. 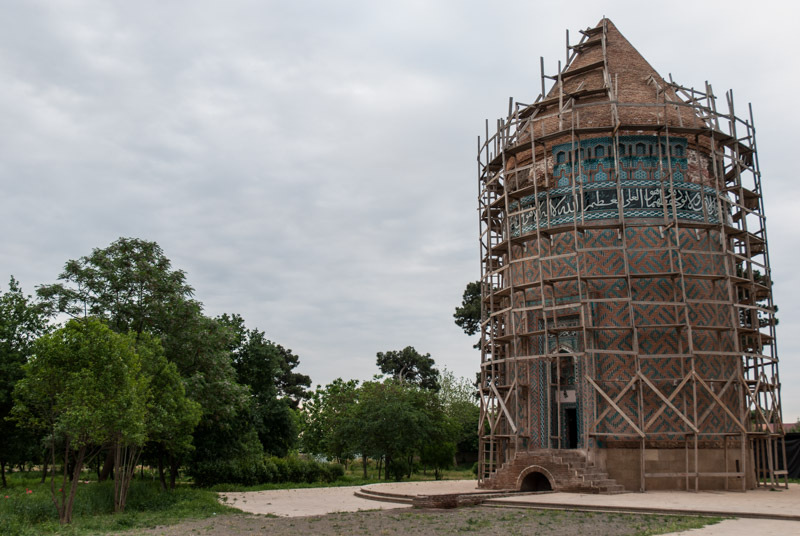 I also look into the rather plain nearby Imamzadeh (Shia shrine), built by the same architect as the now derelict mosques of Shushi and Agdam in Nagorno Karabakh which I had visited last year. I watch pilgrims process anticlockwise around the green-cloth covered tomb of an ancient holy man; an example of the public revival of Iranian-influenced culture of shrine-visiting. I leave Barda heading southwards and begin to deeply enjoy rural Azerbaijan, which grinds along to an ancient routine. 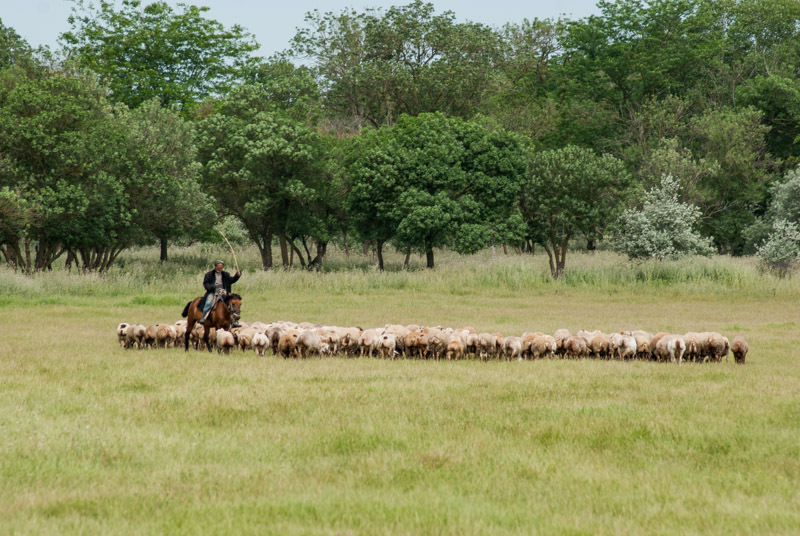 Men on foot or on horseback herd sheep and cattle over the flat plains made green by the water of the Aras, brought in brown torrents by a system of irrigation channels. The air has the scent of woodsmoke and the herb esfand which is burned to war off the evil eye, and this, together with the lumpy Soviet-era roads give me the strong sensation of being in Central Asia. Always off to the west are the misty, greenish mountains of Karabakh, the loss of which weigh heavy on the heart of Azerbaijanis. Road-signs are still in place for destinations such as Füzuli and Agdam which have been razed to rubble, and others such as Khojavand (Martuni) and Khankandi (Stepanakert) which are firmly settled by ethnic Armenians. Even the buses still show destinations in Nagorno Karabakh, despite them lying totally out of reach beyond a tense cease-fire line. The road reaches its southernmost point around the town of Bahramtepe, close to the Iranian border, then turns north-eastwards towards the capital, becoming busy with slow-moving lorries and leaving behind the irrigation canals, passing through a number of dull towns in the dry landscape. Later, a range of parched dry multicoloured hills come into view in the hot, dry air and the landscape is dotted with nodding pumpjacks. In the afternoon I re-join the main highway, here a new dual carriageway which is woefully lacking in exits, no doubt making life difficult for those who live alongside it, though in a country as corrupt as Azerbaijan these people clearly matter little; the road is for the benefit of the rich cadres and cronies of Baku. After a detour and some backtracking thanks to a total lack of signposting I reach the petroglyph site of Qobustan which has a distinctive set of humanoid figures with strange frog-like legs; interesting but somehow less spectacular than the remote rock-art sites of Central Asia and Mongolia. On my way out I stop to look at a lone stone in a barren landscape, unremarkable but for having been inscribed in Roman times; the easternmost Roman inscription ever found. Rejoining the main highway, I bypass the centre of Baku, which I had found to be a vulgar and ostentatious city on my visit in 2010, and head instead for the chaotic roads of the Absheron Peninsula, much of which is now a sprawling extension of the capital. I drive onto the beach in the northern suburb of Pirshagi which is apparently a popular holiday spot, though the less-than-clean sand is backed by a goat-grazed wasteland of litter and sewage. 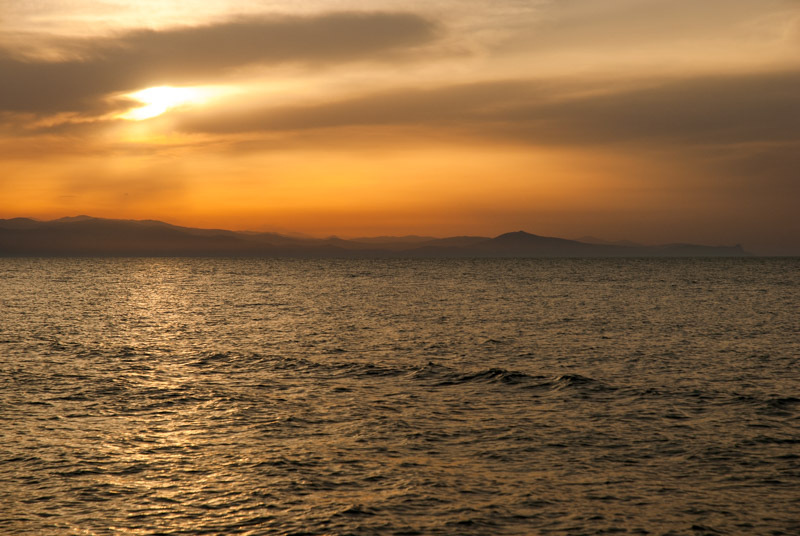 The sunset view across the turquoise water of the Caspian towards the eastern edge of the Caucasus Mountains is however magnificent, and I decide to stay for the night. The Absheron Peninsula presents a truly blighted-looking landscape; dismal parched ground with putrid salt lakes, an ever-present bitter, sulphurous stench in the air, and sprawling formless towns choked with heavy traffic on pot-holed, poorly-planned roads. Absheron is however a land rich in hydrocarbons, which spew naturally from the brackish earth. The peninsula’s oil has been exploited for well over a thousand years, was the focus of Eurasia’s first oil boom, and was one of the prizes Hitler sought when he invaded the Soviet Union in 1941. I visit a few sights relating to this natural abundance of hydrocarbons, firstly the Ateshgah or ‘fire temple’ in Surakhani which seems to have been built in the sixteenth or seventeenth centuries by Hindu immigrants from India around a (now exhausted) natural gas flare, and is recorded as having been worshipped by Sikhs and Zoroastrians as well as Hindus. I then drive northwards through a forest of oil derricks to a curiosity known as Yanar Dag, where a burning flare of natural gas escapes along a short section of exposed sandstone. Most interesting however is a particularly desolate area nearby, where oil streams from a natural seep down a hillside. I walk up to the top of the hillside and see a landscape cratered by the remains of hand-dug oil wells dating from the nineteenth century, before the invention of modern drilling techniques, when oil was exported to Persia. From this vantage point, across the wasteland of Absheron is the modern skyline of Baku, now rich from oil produced by offshore fields under the Caspian. Heading north through Sumqayit and leaving the Absheron Peninsula, the land starts to green once more as I climb slowly inland, passing through the attractive town of Quba on the Gudyal River. The road out Quba steepens immediately, entering beautiful beech forests popular with domestic tourists, who ruin the tranquillity with blaring low-quality music and piles of litter. Not far beyond however, the road leaves the villages and begins to climb steeply into the highlands, a spectacular landscape of flowing, treeless emerald hillsides grazed by great herds of sheep, with distant views of the snow-capped eastern peaks of the Caucasus. I stop at the end of the road, in the village of Khinaliq, which sits at an altitude of around 2100 metres. 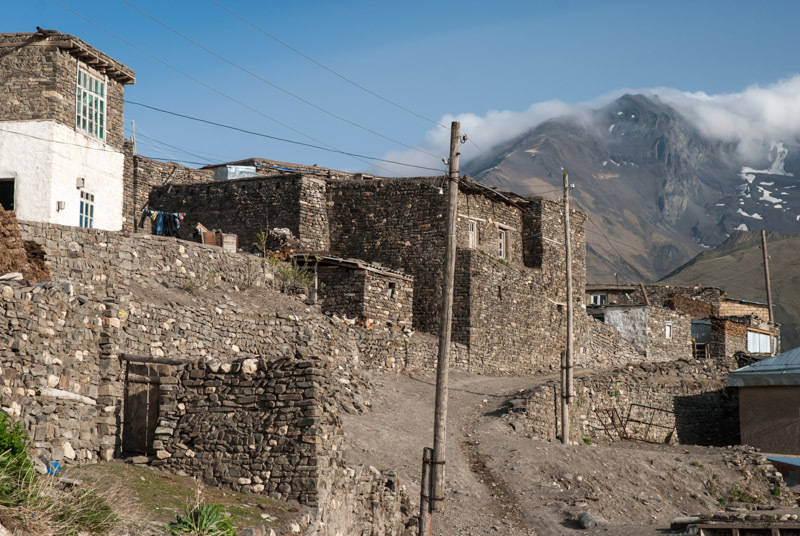 Although some modern buildings have cropped up, much of the village consists of traditional dry-stone houses, some terraced one above another, looking very much like a Dagestani aul (fortified village). Khinaliq is a very ancient settlement and its pale-skinned people speak their own language, which may even be a language isolate. I walk around the very friendly village enjoying the fresh air and magnificent views to cloudy mountain peaks, walking on ancient trails between the stone houses against whose walls are often stacked large piles of dung patties, an essential fuel source in this totally deforested corner of the Caucasus. The beautiful mountain atmosphere and friendly villagers make me wish I could stay some time in Khinaliq, but I’m limited by customs restrictions to seventy-two hours in the country with the truck. 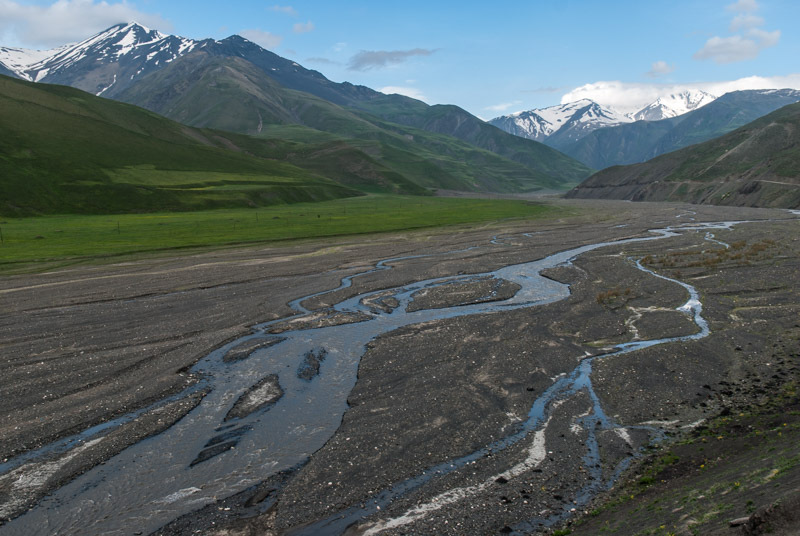 I camp nearby however, on the broad bed of the Gudyal River, looking up the valley towards the mountains on the Russian border. In the morning, after a few hours relaxing and admiring the scenery, I descend once more to Quba and have a quick look around. It’s a pleasant place with unfailingly friendly people, like everywhere I have encountered in Azerbaijan, but the real point of interest for me is the town of Qirmizi Qasaba, lying on the far side of the river. Qirmizi Qasaba is inhabited entirely by Mountain Jews, thought to be descendants of Persian Jews who themselves were descended from the ancient Israelites who were exiled to Babylon by the Assyrian King Nebuchadnezzar in the sixth century BCE. Escaping persecution, the Mountain Jews began to move to various isolated valleys of the Caucasus in around the fifth century CE where they have lived ever since. In the nineteenth century they escaped the rules of the rest of the Russian Empire which forbade Jews from farming and were even in some cases spared by the Nazis in the Second World War, who were unsure as to whether the Mountain Jews were ‘Racial Jews’. Today Qirmizi Qasaba is one of the last strongholds of the Mountain Jews and, although not populated by Yiddish-speaking Ashkenazi Jews, could be regarded as the world’s last shtetl. It’s perhaps slightly tidier and wealthier looking than the rest of Quba, but only the unassuming Grand Synagogue hint at the town’s unique demographics. The inhabitants too look and dress little different from other Caucasians, but they retain their own language, Judeo-Tat, a Semitic influenced form of Persian. 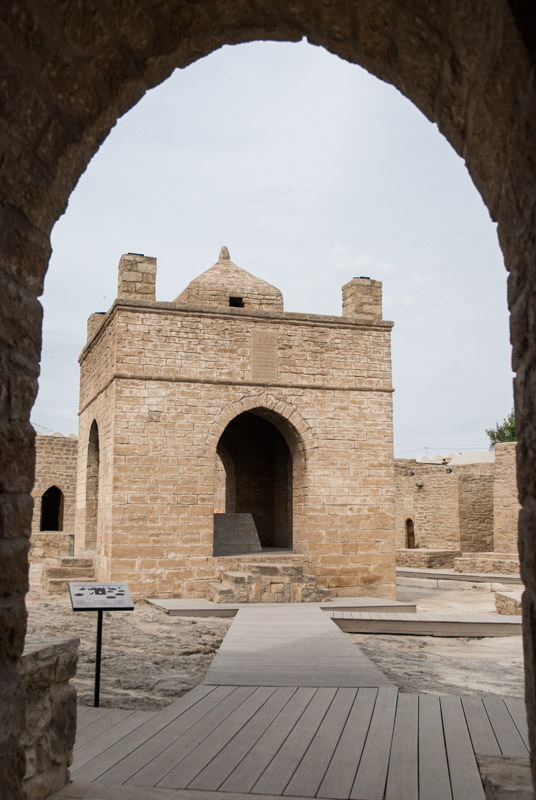 My seventy-two hours in Azerbaijan is coming to a close, and so I make the final drive north through a string of villages on the undulating plains between the mountains and the sea, to the customs post at Samur. Only recently made a multilateral border crossing, I approach the border with some trepidation; after all this is the border between one of the world’s most corrupt countries and the most corrupt region of Russia. However, after a thorough search I’m free to proceed across the Samur River on a boxcar bridge which reminds me of crossing the border between Afghanistan and Uzbekistan, somehow making the crossing seem more momentous than it really is. I’ve greatly enjoyed my journey from the Bulgarian border to the Samur River; the astoundingly beautiful and historically interesting Black Sea Coast of Turkey; yet more beautiful landscapes in Georgia, and then a second transit across ‘mainland’ Azerbaijan, a country which though wealthy from its natural resources, is visibly held back by corruption when compared to its neighbours. I would like to spend longer in the country but am held back from doing so by restrictive bureaucracy, which shows how little interest the government has in welcoming foreign visitors. 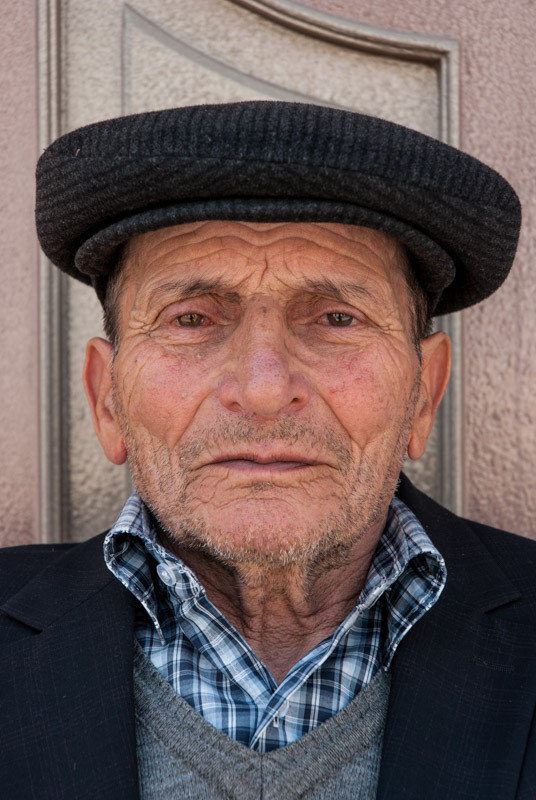 Whilst the people of Azerbaijan are perhaps the most friendly in the South Caucasus, I still cannot bring myself to like the place quite as much as I like Armenia and Georgia. What has also been apparent to me on this trip is that my pace of travel has been slightly too rapid, and so I look forward to the next stage of the trip, moving slightly more sedately across the vast tracts of European Russia, all the way to the Barents Sea, well above the Arctic Circle.